Secret Six is one of those true hidden gems of the comic industry. Granted, it is published by DC Comics, one of the big two, but I feel like this book never gets the press and praise it deserves. It has been for over 2 years one of the most consistently awesome books on the market. 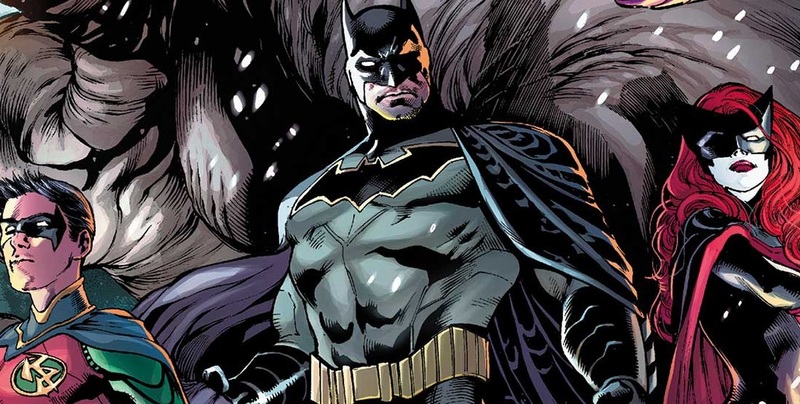 With Gail Simone’s strong hand, she has crafted the most lovable team of psychopaths and killers, the world has ever seen. Watching them get into misadventure one after another has been a pure pleasure for me. However, we won’t turn this review into a gush-fest for the series especially if this issue doesn’t hold up as well. Does it? The simple answer is yes, and I would recommend checking it out now if you have the time and money (and picking up 31 since this is the 2nd part), but if you need more convincing come with me on my journey. “Secret Six” has been an interesting handle for the series for a while since the member count tends to be more often 7 than 6 these days, but we find “The Six” at the start of this issue in hell (true story) as they confront their “friend” Ragdoll. Now before I dive further into the book, I MUST touch on the artwork especially the framing of the pages and panels with all the tortured skulls in the background of most pages. Is it morbid? Just a bit. Is it amazing? You bet your arse it is! And again, they are in hell, I’m assuming its not a winter wonderland. Back to the story, “The Six” led by Scandal Savage have followed Peter Merkel aka Ragdoll to hell to gain possession of the “Get Out of Hell” free card, an all expense paid trip out of… well hell. 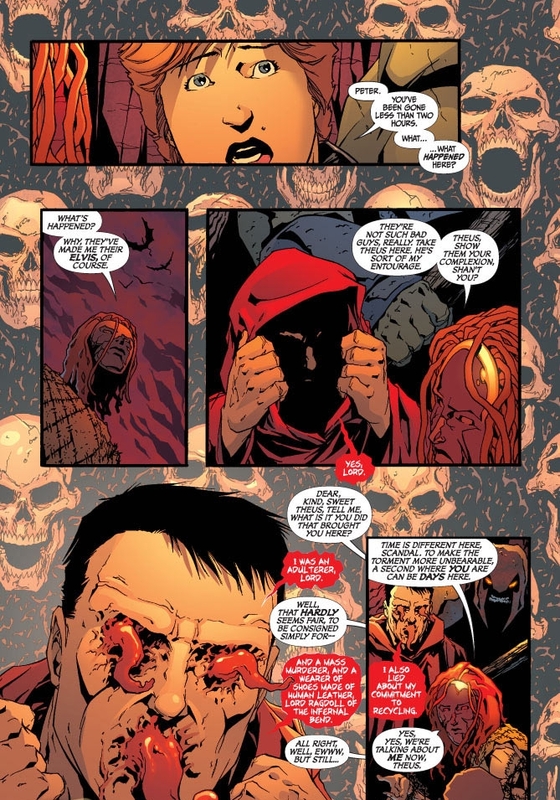 The exchange between Savage and the Six and Ragdoll and his “The Secret Six Hundred and Sixty-Six” forms the bulk of the story. And this is where Simone’s love of the characters and the world shines as there isn’t a single blow traded between the two parties until about 3/4th of the way through the issue, but the discussion and exchanges are compelling and in some ways griping. There are some twists that could only be pulled off by these characters, and she handles it like a pro. Ragdoll’s reasoning for wanting to be in hell is unique, but makes so much sense when you know the character. I won’t ruin what happens at the end, but it was a hell of a twist and I can’t wait to see how it concludes next month. The other story in this issue deals with Catman and Etrigan going off on their own personal mission in hell, and while the pay-off may be lost on some (as it kind of was on me), it does make for an interesting story continuation from several arcs ago. Again, I won’t ruin anything, but we are due a big pay-off on both stories next issue. I already mentioned my love of the backgrounds in the comics, but as a whole, the art in the book is extremely strong. The characters are drawn solidly and some of the hell inhabitants are well the stuff of nightmares really, but again it is HELL. As mentioned before, I recommend checking out this issue, and if you haven’t, catching up on the series. It truly is just that damn good. New Reader Accessibility: 6 The issue itself it fine, but I always knock a few points off for an issue that is in process of telling a story, and this does kind of deal with issues that have been building in the series, but not knowing them wouldn’t really effect your enjoyment of this issue. Hey, there, big fella. My name’s King Shark.